Are trains still a growth industry prospect for manufacturers? The 2013 Gear Technology Buyers Guide was compiled to provide you with a handy resource containing the contact information for significant suppliers of machinery, tooling, supplies and services used in gear manufacturing. Very important gear industry suppliers are featured here. The final installment of our Job Shop Lean series includes a wide variety of educational resources to help you continue your own lean journey. 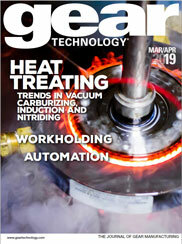 The complete Product News section from the November/December 2013 issue of Gear Technology.